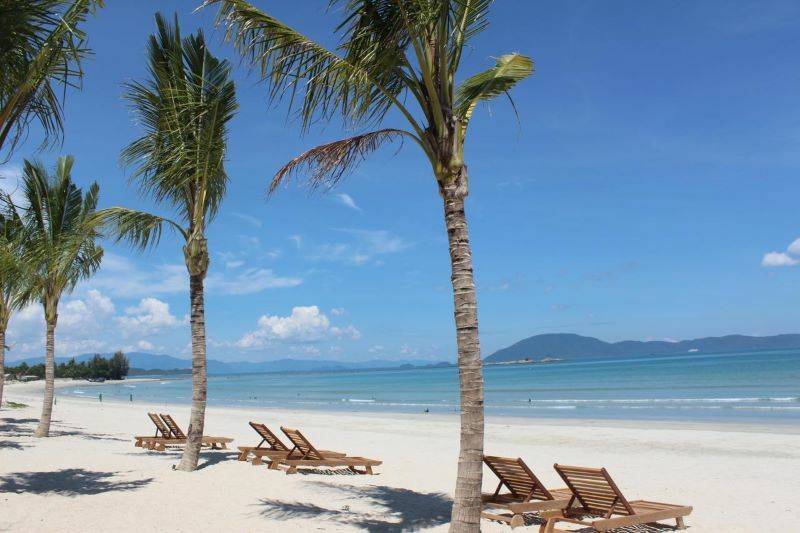 Besides golden white sandy beaches, unspoiled small islands, beautiful coral reefs and thrilling games, Nha Trang also has a beautiful destination like a winter country with snowflakes (which is the white sea salt), the destination is Hon Khoi Salt Fields. 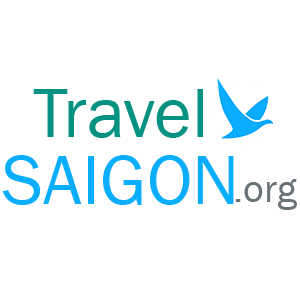 Located 45 km away from Nha Trang city, with an area of about 400 ha – Hon Khoi Salt Fields is considered one of the largest salt fields in Vietnam with about 737,000 tones of salt every year. The salt fields is not only bring incomes for local people but also considered an attractive tourist destination with pure white salt fields, creating featured beauty for this coastal region. Hon Khoi Salt Field in Ninh Hoa district, Khanh Hoa province has a reputation for salt making. Coming to Hon Khoi Salt Field, from a quiet far distance, visitors can hear the salty smell of salt and feel the harsh heat coming from the beach. 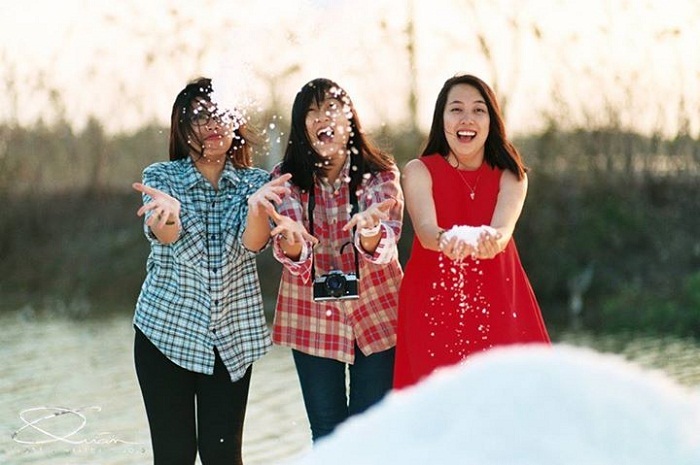 The best time to visit Hon Khoi Salt Field is between the month of January and July, which is the time of salt season. 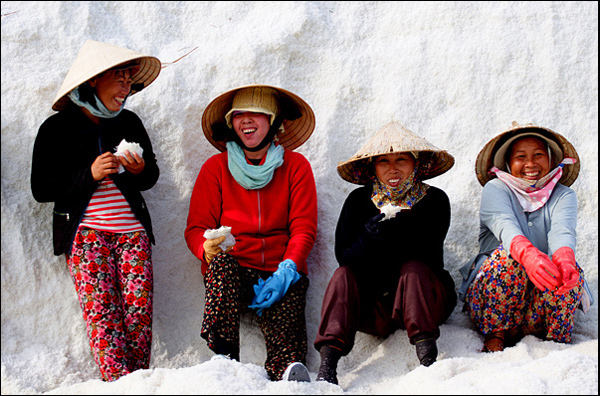 Come here, visitors can witness a hard working day of salt workers in the salt fields. 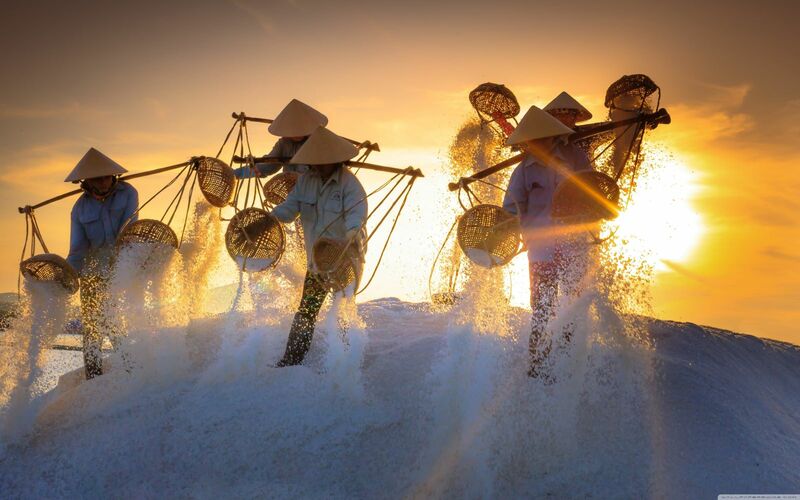 In the harvest, salt farmers have to work from the early in the morning at about 4.00 AM and manage to finish their work as soon as possible in order to avoid the scorching in the field. 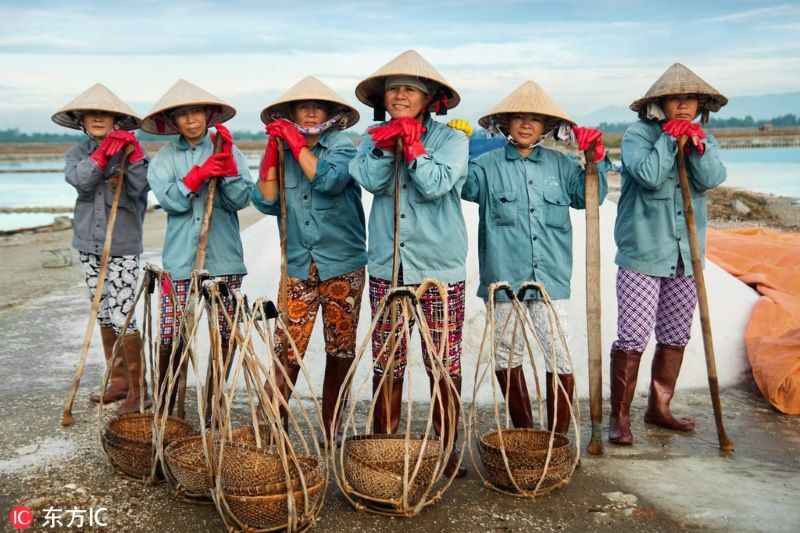 Unlike most salt fields in Vietnam, working in the Hon Khoi Salt Field are mostly women in middle-age. 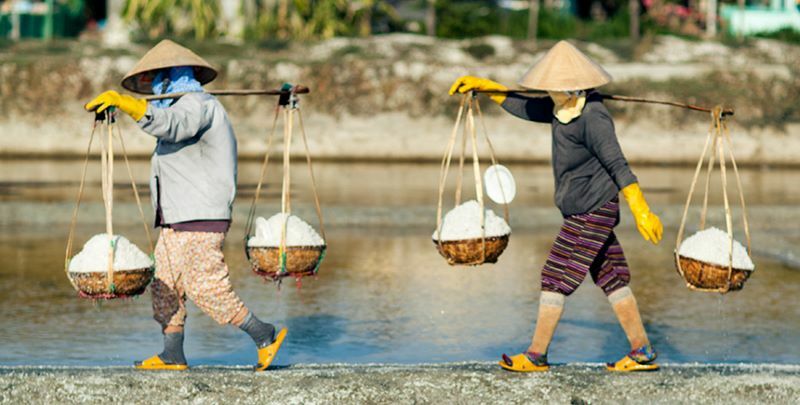 The female workers load sea salt into double bamboo baskets to be carried to the drying place meanwhile the men undertake hard work including for foraging and collecting sea salt. Despite the hard work, the field is filled with joy and laughter. Making salt is a very difficult and hard work. It requires strength, perseverance and working hard. 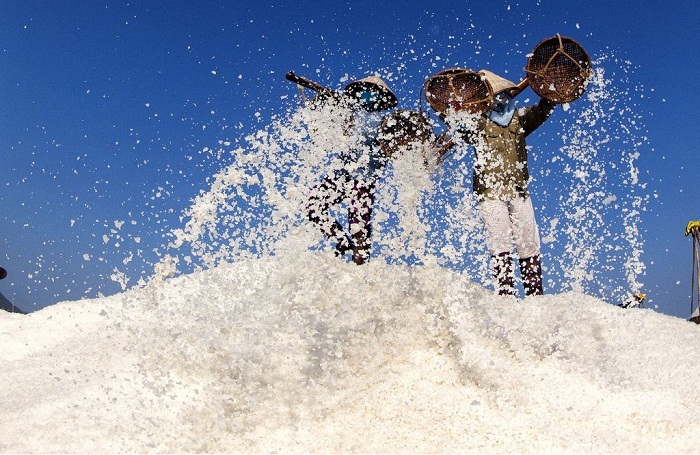 The salt workers (also known as the salt makers) must be in good health and withstand high pressure. To protect themselves from the burning sunlight in the field, they ought to wear conical hats, rubber gloves, boots and facemasks. While the harsh working conditions make their skin tinged with sunshine, however, when meeting guests from far away these people are approachable, friendly with cheerful smiles dispelling fatigue even though they can only speak in their mother tongue. Hon Khoi with its original beauty has entered into the lens of so many domestic and foreign photographers. They capture the pictures of salt makers who are digging, scraping, hoisting, carrying salt from the early morning when the sun has not yet appeared to the darkness when there is no sunshine; the pictures of the mounds of natural white salt, the salt fields reflected in the golden rays like a giant beautiful mirror at stunning dawn. 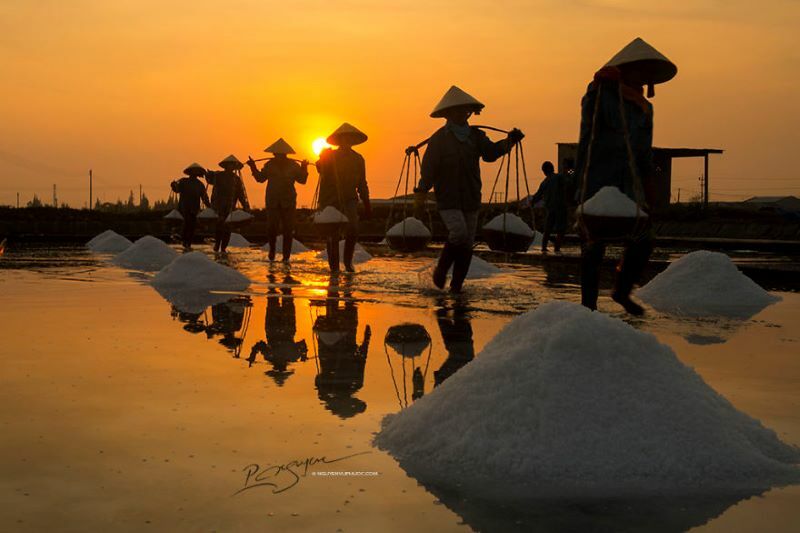 Everyone is attracted by the irresistible beauty, the unique beauty of the salt field especially when the sun go down. 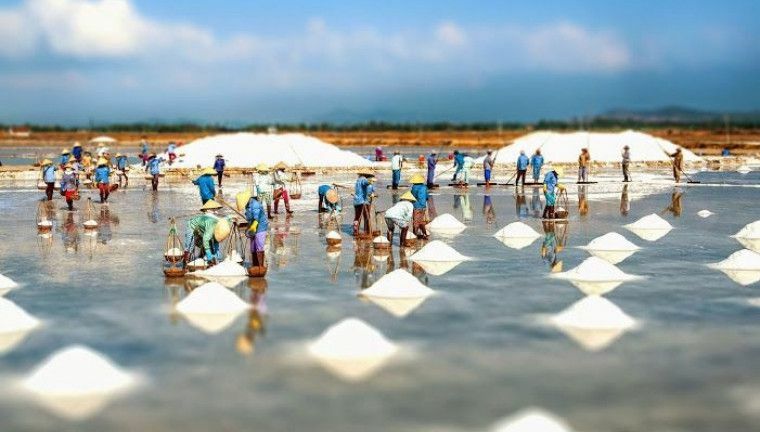 To see and touch the new salt grains in person exposed in the sunshine as well as discover the beauty of people making salt or enjoy the “snow white in the summer”, you should come to Hon Khoi Salt Fields. Come here, you will understand more about the hardship of workers making sea salt, appreciate the sea salt which taken the effort of many people. As it is a working industry in Nha Trang, visitors shouldn’t expect tourist facilities in Hon Khoi Salt Fields. 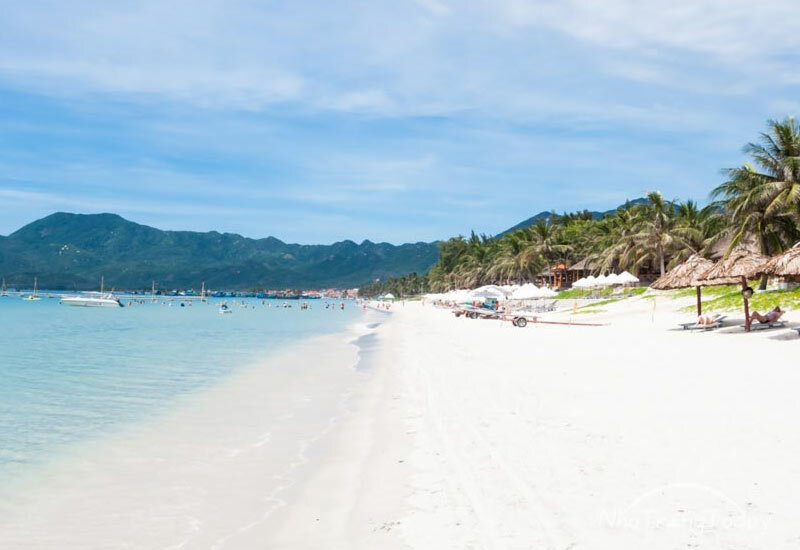 However, there still exists some cheap hostels or you can choose to stay in one of the two resorts here namely White Sand Doclet Resort & Spa Nha Trang and GM Doc Let Beach Resort & Spa. There are not many restaurant here but you can ride a bike or a motorbike from your hotel to the Hon Khoi Habour to get something to eat. In the habour, so many fresh and delicious but cheap sea food are served. You can eat as many as you want and do not have to worry about the price. After visiting beautiful Hon Khoi Salt Fields. Travellers can go to the beach nearby, which is Doc Let beach. Doc Let beach is the wild and rustic beauty of nature. The beach has a blue ocean line covered more than 2.5 km in the length of a fine white sand beach. Away from the shore about 100-110 m, the water level only reaches to your chest, spreading far away, not as deep as other beaches. In addition, the water surface ripples smoothly, the sea water is clear and clean. The highlight on the pure white sand is the purple-colored sea lily flowers. Doc Let beach is more beautiful with grassy roads, green stone paved for guests to walk. You also can climb the nearby hills to explore the feeling of conquest. 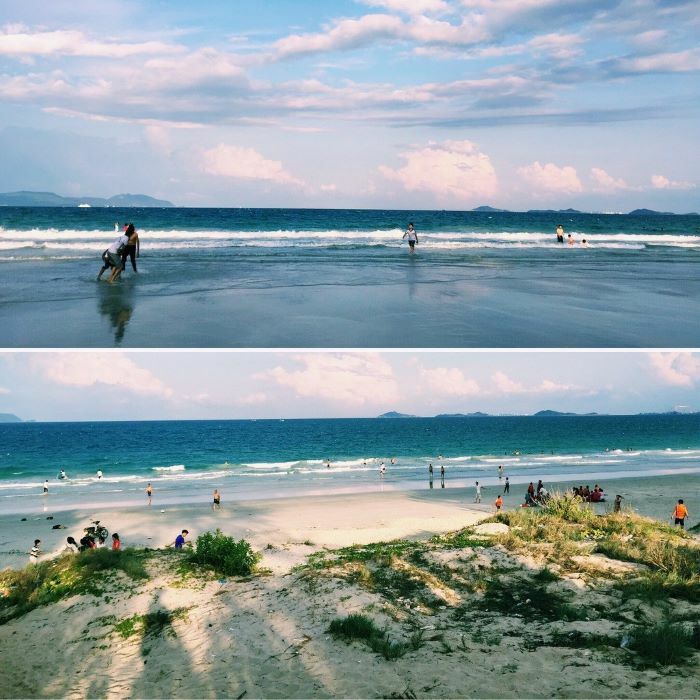 Besides the wild beauty, Doc Let beach is more attractive by the improvement of human. The straight rows of coconut with the height of the body less than 2 m, planted more than 10 years ago have blossomed. The coconuts swooping down to the head attract visitors’ glances. 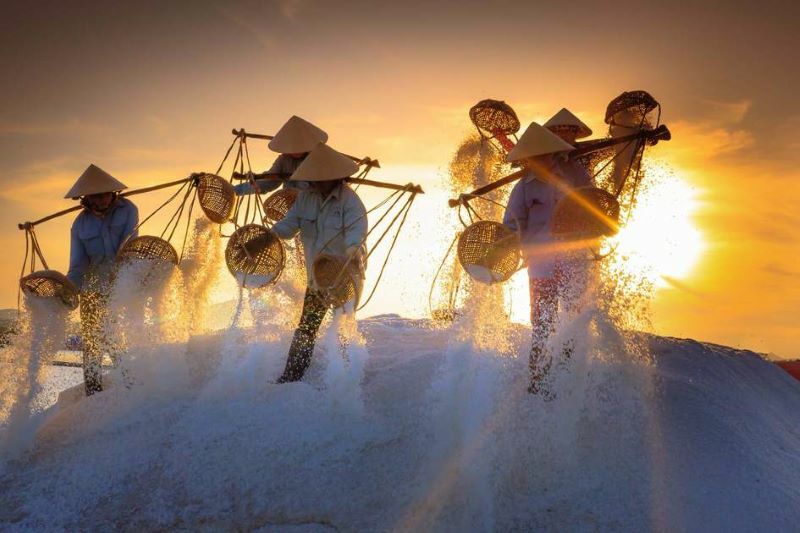 Coming to Hon Khoi Salt Fields, you are able to have a culturally rich experience to see the locals working throughout in the early morning until the dawn. 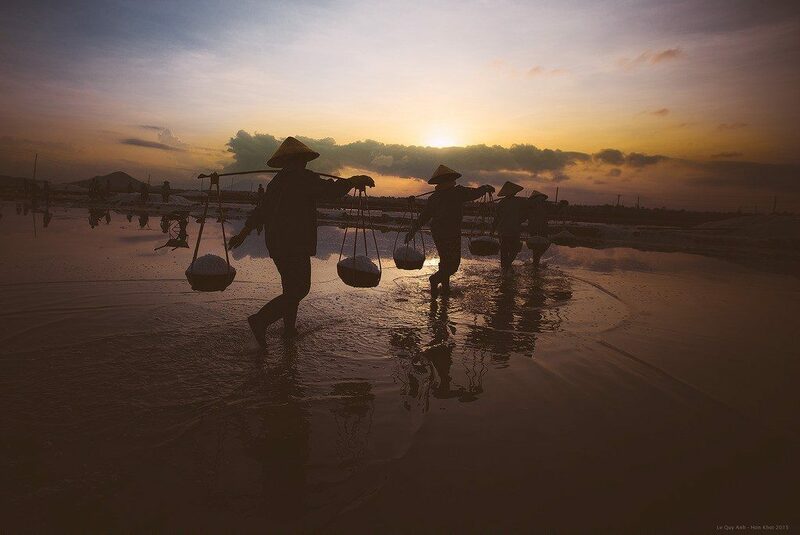 Additionally, visitors can admire the immense beauty of the salt fields and discover the beauty of the labor spirit, the optimism of the salt farmers who put on their shoulders a heavy burden of salt but always have big smiles on their lips. How beautiful and unique it is!